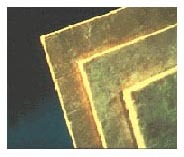 Rigid boards are plastic foams or fibrous materials pressed or extruded into board-like forms. Common materials include polystyrene, urethane or glass fiber. Polystyrene and urethane have superior insulating qualities, and would therefore make them a better choice than batts or blankets if it were not for their flammability. When installed inside a house, the boards require an additional covering of a minimum of 1/2 in.-thick fireproof material such as gypsum wall board. Rigid board has the advantages of structural strength, low weight and high R per inch. To achieve an R-30 using glass fiber blankets would require roughly 8.5 inches. With rigid urethane boards, R-30 can be attained with only 5.5 inches. Rigid boards come faced and unfaced. Some are faced with a reflective material that acts as a vapor barrier and reduces heat flow when facing a dead air space.